Paleo Pizza… how can it be? Paleo by definition means no carbs or no grains and no dairy, so how in the world could you even attempt to create anything that even resembles pizza and be paleo at the same time? Well… this family was hankerin’ for some pizza! I have made it with a grain free crust before, but it’s pricey to do and takes more time than I like to put into making dinner. I don’t mind doing it once in a while, but this was not going to be one of those times! We had lots of peppers in the fridge and sometimes it’s hard for me to use them before they go bad. I had about 5 of them and knew there was no way we were going to get to them, so I thought that doing some sort of stuffed pepper would be a good way to use them. If I could just figure out how to make them taste like pizza it would be a win-win situation! 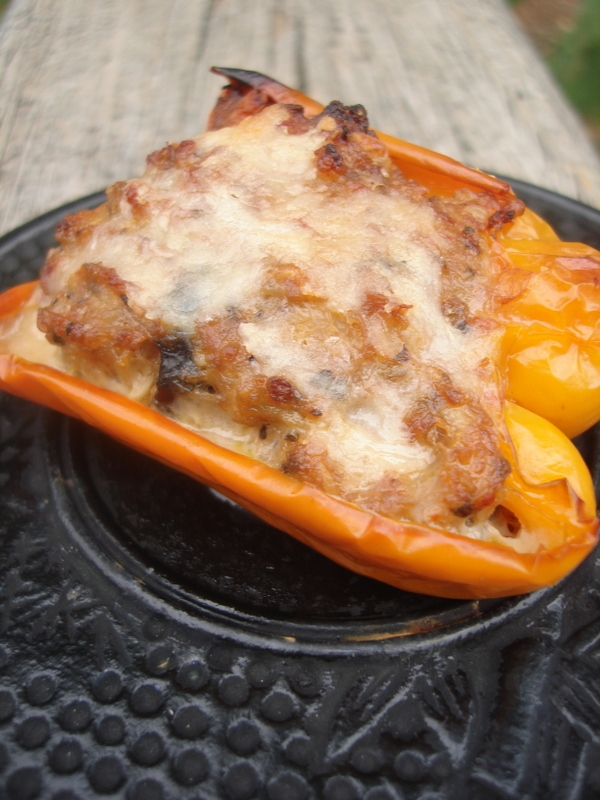 Then the kids would be excited about them… cause stuffed peppers are definitely not their favorite food! I started with a little of this and a little of that and the kiddos gave suggestions as to what they thought should be added to make it taste more like pizza! They did a great job helping and I was so glad I got their opinions. They definitely added some things that I would have forgotten about… like the olives! Little Aisling LOVES olives. She would eat the whole can or jar if I turn my back for too long. And it doesn’t matter the type, kalamata, black, green… she doesn’t care! So of course she wanted to add some and was adamant they were black ones, which I agree for a traditional pizza black is best! So how did we do it you ask? Read on and give it a try! Mix raw meat and sauteed onion and garlic and next 8 ingredients through the olives. If you eat dairy, a slice of raw cheese on top is delicious, but it still has a pizza taste and flavor without the cheese! Ordinarily I’d say pizza just doesn’t taste right without the cheese but with these you hardly missed it! I’d love to know what you think! This will definitely be a repeat in this house! And all the kids ate every bite! Success in my book! Next Tropical Traditions Coconut Oil Winner!! !